Our Heavy storage benchmark is proportionally more write-heavy than The Destroyer, but much shorter overall. The total writes in the Heavy test aren't enough to fill the drive, so performance never drops down to steady state. This test is far more representative of a power user's day to day usage, and is heavily influenced by the drive's peak performance. The Heavy workload test details can be found here. This test is run twice, once on a freshly erased drive and once after filling the drive with sequential writes. 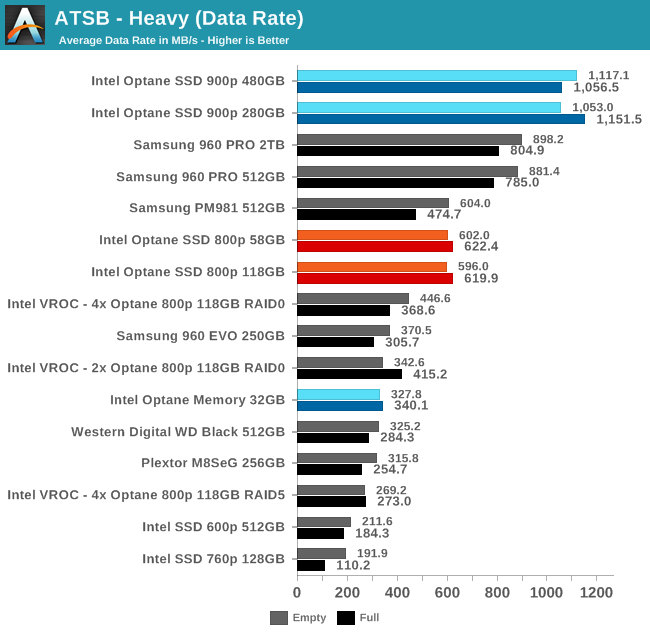 As with The Destroyer, the average data rate of the Intel Optane SSD 800p puts it near the top of the rankings, but behind the fastest flash-based SSDs and the Optane 900p. 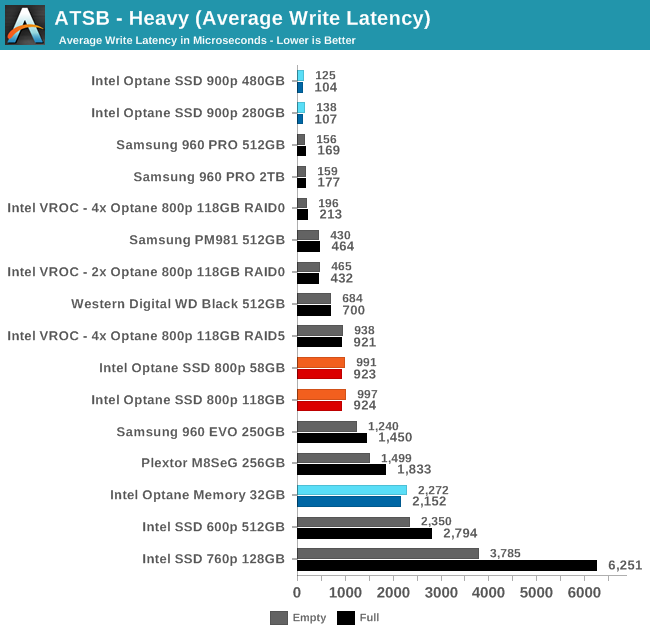 Intel's VROC again adds overhead that isn't worthwhile without the high queue depths of synthetic benchmarks. 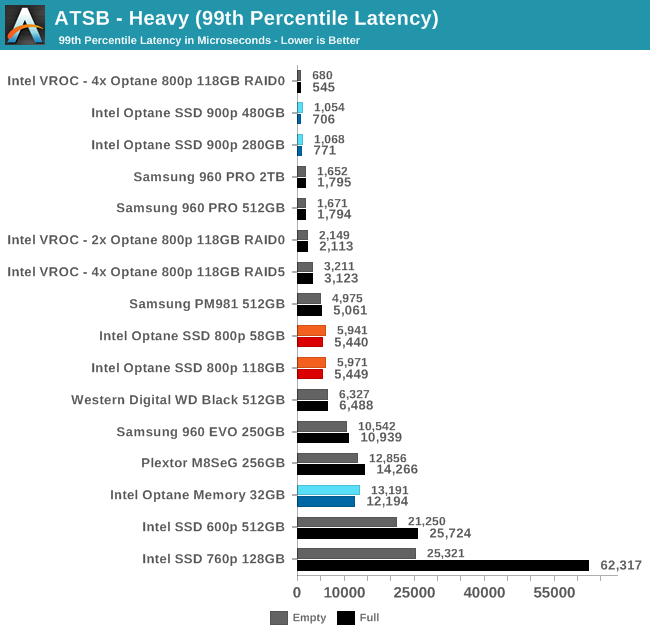 The average and 99th percentile latencies of the Optane SSD 800p on the Heavy test are better than any of the low-end NVMe SSDs, but it is only in RAID that the latency drops down to the level of the best flash-based SSDs and the 900p. 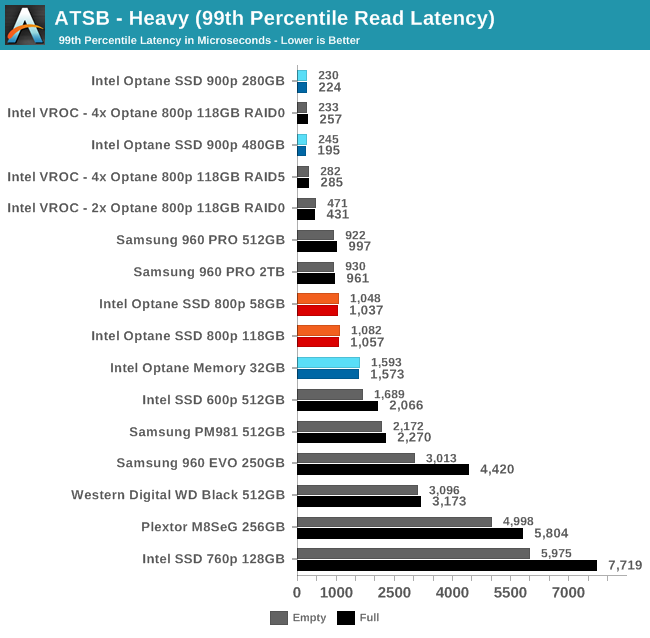 The average read latency of the Optane SSD 800p ranks second behind the 900p. 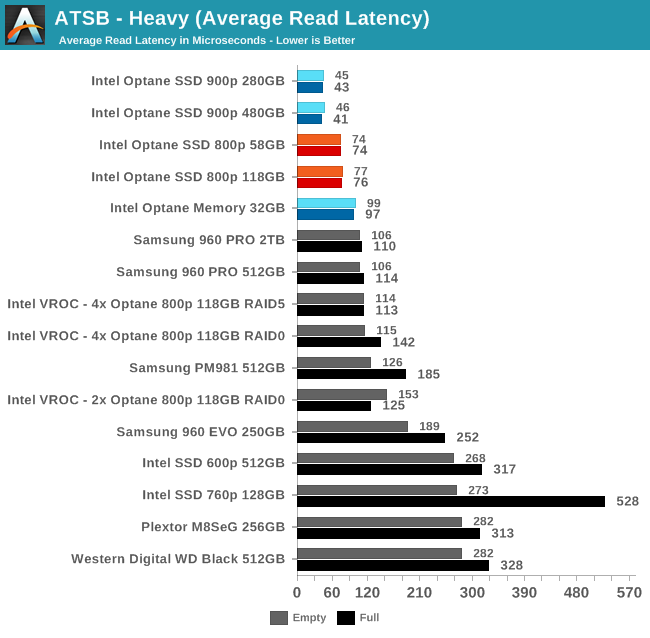 VROC adds enough overhead that the RAID configurations end up having slightly higher average read latencies than the Samsung 960 PRO. For the average write latencies, VROC is far more useful, and helps the 800p make up for the lack of a write cache. The 99th percentile read and write latencies of the 800p RAID configurations are on par with the 900p, but the individual drives have slightly worse QoS than the Samsung 960 PRO. The 800p again leads in energy usage thanks to its high overall performance without the high baseline power consumption of the 900p. 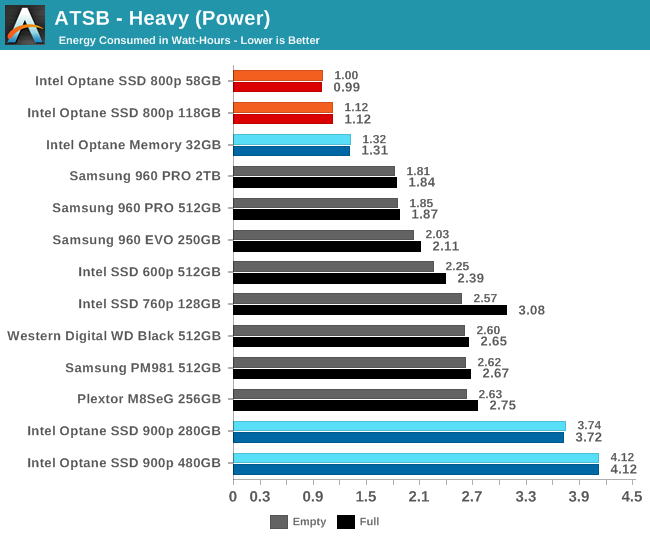 The budget NVMe SSDs all use at least twice as much energy over the course of the test, and the Samsung 960 PRO is closer to the budget drives than to the 800p. It keeps getting worse and worse instead of getting better. The next x-point iteration may slip below nand even in the few strong points of the technology. Also, it doesn't seem that enterprise is very interested in intel's offering, seeing how they struggle to cram the product in market niches where it is xtra-pointless, I'd go on a limb and assume that's not because of love for consumers or skipping on them fat enterprise product margins. Also, it seems that intel gave very misleading information not only in terms of performance, but also regarding the origin of the technology. The official story is its development began in 2012 as a joint venture between intel and micron. That however is not true, x-point can be traced back to a now erased from history company named Unity Semiconductors, which was flogging the tech back in 2009 under the CMOx moniker. Rambus renamed it to ReRAM according to this article in 2015, so it would seem the tech lived on through Rambus after the aquisition of Unity Semi. Yes. But I guess we won't see that for a while. Latency and power consumption are great... but speed and capacity leave a lot to be desired. When MacBook Pros have NVME drives capable of 3.2 GB/s (yes gigabytes) at a 2TB capacity... Optane is far behind. No human notices microseconds. Delay becomes noticeable at about 10-20 msec, depending on the individual's reflexes, becomes annoying at about 50 msecs, and becomes detrimental at 200+.